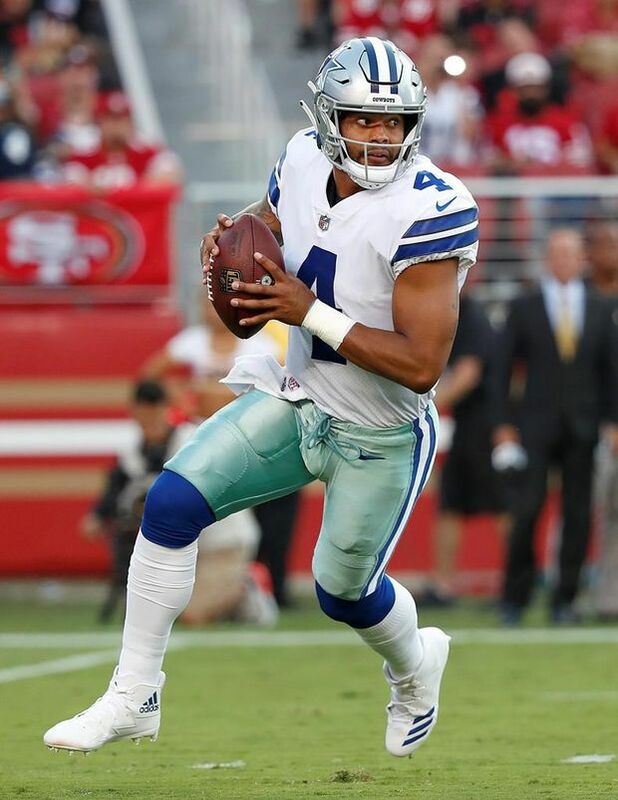 Dallas Cowboys quarterback Dak Prescott (4) looks to pass against the San Francisco 49ers during an NFL preseason football game, in Santa Clara, Calif. on Aug. 9, 2018. Dak Prescott and Cam Newton find themselves in similar situations entering Sunday’s regular-season opener at Carolina. The Cowboys will be looking to replace wide receiver Dez Bryant, the team’s career leader in touchdown catches, as well as tight end Jason Whitten, who retired after 15 seasons. Dallas's primary options to be slot receiver are Cole Beasley, Allen Hurns and rookie Michael Gallup. But Tavon Austin and Terrance Williams could be factors, too. Geoff Swaim and Blake Jarwin are the top two tight ends. Dallas also has holes to fill up front with All-Pro centre Travis Frederick battling a rare auto-immune disorder called Guillain-Barre syndrome and is doubtful for the game. Six-year veteran Joe Looney will get the start alongside rookie left guard Connor Williams. Pro Bowl right guard Zack Martin is set to start after dealing with a hyperextended left knee in the second preseason game. The Panthers upgraded their speed at wide receiver in the off-season by trading for veteran Torrey Smith, signing free-agent slot receiver Jairus Wright and using a first-round draft pick on D.J. Moore. All three figure to play a role in the passing game alongside returning No. 1 receiver Devin Funchess. “We don’t know what we have yet and that is why Sunday is so important for everybody – because we finally find out,” Newton said. Carolina’s offensive line was going to have a difficult time replacing All-Pro left guard Andrew Norwell – and that was before it got hit hard by the injuries. Second-team All-Pro right tackle Daryl Williams, left tackle Matt Kalil and Norwell replacement Amini Silatolu all went down with knee injuries in the preseason. Kalil went on injured reserve, meaning Taylor Moton will make his first NFL start at left tackle. Williams and Silatolu returned to practice this week, but it’s still unclear if they’ll be healthy enough to play against Dallas.